If you have a blog, you may want to use an RSS campaign to email new posts to your subscribed contacts. RSS campaigns use merge tags to pull in RSS (Real Simple Syndication) content from a blog feed. 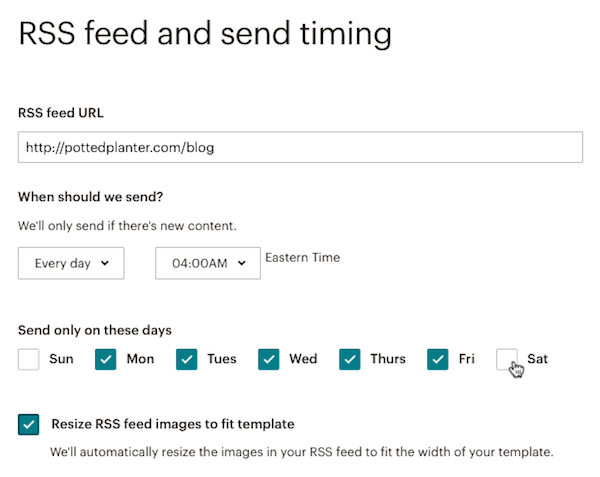 When an RSS feed is updated with new blog posts, Mailchimp will pull that content into the campaign and send it to your subscribers on the schedule you choose. 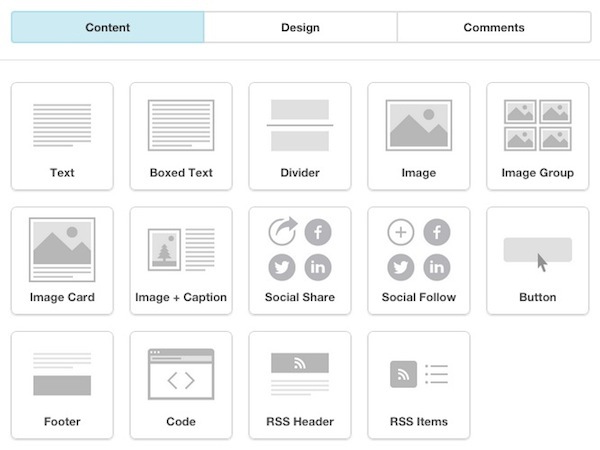 In this article, you'll learn how to create an RSS campaign with the Campaign Builder. You'll need the URL for your RSS feed. If you want to include content from multiple feeds, you can use our FEED merge tag to add multiple RSS feeds to one campaign. Or use a feed aggregator like RSSUnify or RSS Mix to combine multiple RSS feeds into a single feed. You can't control the RSS content via the Campaign Builder. If you want your content formatted a certain way, edit the RSS source directly. When you first set up an RSS campaign, we show the last post that was added to your feed as an example as you build your campaign. We don't send campaigns to your audience unless there's something new to send. For example, if you set your campaign to send weekly but haven't posted in more than a week, we won't send to your audience until there is a new post on the day your campaign is set to send. If this is the first time you send your RSS campaign, we'll only send posts from the last 24 hours for daily, from the last seven days for weekly, and the last 30 days for monthly. After that, each new send will pull all posts made to your feed since the last send. RSS campaigns are built in a series of steps, like other email campaigns. To create a new RSS campaign, follow these steps. Navigate to the Campaigns page. Enter a campaign name and choose an audience. You'll choose the RSS feed you want to use and other settings on the RSS Feed step. Type your feed's URL in the RSS Feed URL field. Choose your send time and other options. Choose from Every day, Every week, or Every month. Use the drop-down menus and checkboxes to choose the day(s) and time you want your RSS campaign to send. Check this box if you want Mailchimp to resize the images in your feed to fit your template. This will help prevent your campaign from stretching. This option only resizes images pulled in via the *|RSSITEM:CONTENT|* or *|RSSITEM:CONTENT_FULL|* merge tags. It won't work when the campaign is viewed in Outlook, and videos can't be resized. If you see an error message when you enter your RSS feed address, run it through a feed validator. Choose the audience or segment you want to send your campaign to. To send to a segment, configure a new segment on this screen, or choose a saved segment. The Setup step is where you'll type in campaign details, like your Email subject and From name, that your subscribers will see when each email in the RSS campaign is sent. Type in your campaign details in the fields provided. Check the boxes next to any additional settings or tracking options that you want to include. The *|RSSITEM:TITLE|* merge tag can be used in the subject line of your RSS campaign to pull in the title of your most recent blog post, but you should thoroughly test your campaign before you send. A few factors contribute to whether the title of the most recent post will always display. The Template step is where you'll choose the layout you want to use. You can create an RSS campaign from any of the available templates, and use our RSS content blocks to pull content from your feed into your campaign layout. If needed, you can switch templates later. The Design step is where you'll design your campaign. Use RSS content blocks pre-loaded with our RSS merge tags to customize the content that's pulled into your campaign. RSS merge tags pull information from your feed into your campaigns and tell our system what to look for when checking your feed. If these tags are missing, your emails will deliver without content. The Confirm step is where you'll review your campaign. Review the Pre-Delivery Checklist, and preview and test your email campaign if you haven't already. Click Resolve or Edit to make changes to any section of the campaign. Click Start RSS to send your RSS campaign based on the schedule you chose, or click the drop-down arrow and choose Send Now and start RSS campaign to immediately send a campaign and start the schedule. RSS campaigns function differently than other types of Mailchimp campaigns. When you create an RSS campaign, we generate the parent copy of the campaign that is referenced for each individual send. When the RSS campaign sends to your list at its scheduled time, each sent copy is referred to as a child of the parent campaign. We generate a campaign report for each child RSS campaign. To see an overview of the child campaign reports for a parent RSS campaign, follow these steps. If you have more than one audience, click the Current audience drop-down and choose the one associated with the campaign you want to work with. Find the parent RSS campaign you want to work with, and click Sent Campaigns. This will take you to a list of all the sent child campaigns for that RSS campaign. Click View Report to view the report for a child campaign. If your campaign has errors, take a look at our troubleshooting resource to find out how to resolve common issues with RSS. Learn how to create a regular email campaign. Need help getting started with Mailchimp campaigns? This article walks you through the basics.